A common cause of the above problems can be with the EADM (Electronic Arts Download Manager) aka Origins - a separate program that comes with the game for managing downloads. Before attempting the following steps, if you have Digital Download versions of the games, you might want to backup the contents in the following folders to another location, so you would not have to redownload gigabytes worth of files again. There would be different folders for each game or add-on purchased. Backup the contents of those folders or burn them to a disc. Try uninstalling and then reinstalling EADM Origins. 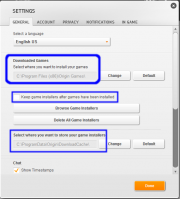 To Uninstall: Follow these instructions from EA on doing a manual uninstall. Make sure to reboot your computer after uninstalling! If the EA link is no longer available, use our Game Help:TS3 Uninstall instructions. You need to look for the specific EADM Origins registry entry and folders. Allow Adobe Air to install and then update, if prompted. After rebooting, EADM Origins might prompt you for another update. Allow it to do so. This page was last modified on 8 November 2011, at 06:00. This page has been accessed 98,640 times.